So, let us begin. Well, first, what is War Room? 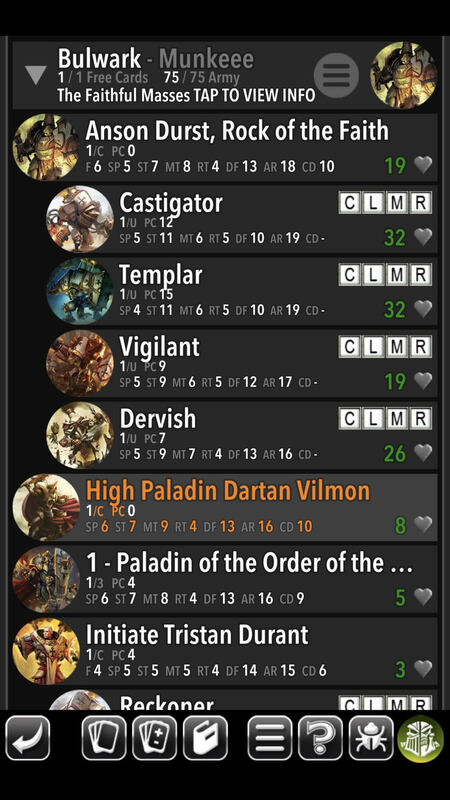 War Room is a companion app for WARMACHINE & HORDES that provides a ton of information about the game, gives quick access to the rules, keyword look-ups, and model details, plus a couple other cool, built-in features that we’ll cover here. War Room is available on most Android and IOS devices and can typically be used on both your smartphone and tablets. When you’re looking for it on your Appstore, make sure you download War Room 2, as the original War Room is for the prior edition of the game, and the content is not up-to-date with the existing version of the rules. I’ll be using the term “War Room” to refer specifically to War Room 2, which is more feature-rich. Once you have War Room, you will likely want to purchase and download a Faction deck. The core app itself is free; the costs are based only on which decks you purchase. You can purchase decks individually, or there are a couple bundles you can purchase that save you some money. Don’t worry! 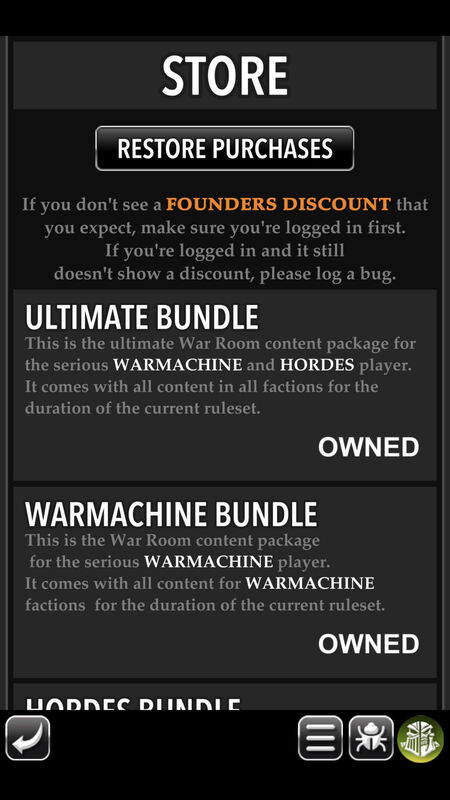 We frequently update War Room with new model rules and rules errata, but after you purchase a Faction deck, any time we make any changes to that Faction, the rules are automatically updated in your War Room and any new models are added free of charge! 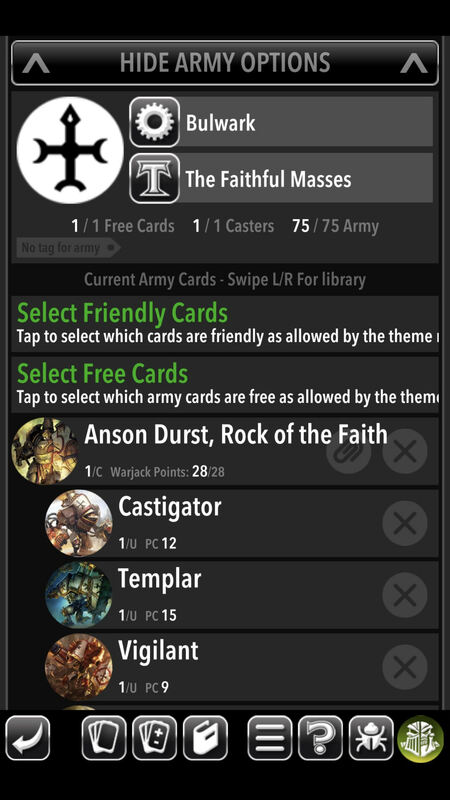 Now that you have the app installed and you’ve purchased a Faction deck (or maybe a bundle of multiple decks), you have a bunch of things you can do with them. One of the main functions of War Room is the “Build an Army” option, which allows you to construct armies of variable game size, including some game-style and collection modifiers. Remember to name and save your lists so you can refer to them later and make adjustments! Another popular feature of War Room is the “Go to War” function. This allows you to load up a list you’ve saved and do a bunch of useful things like tracking damage on models. There is even an option to load up a time clock, so you can play using a timer (traditionally how the game is played at tournaments). 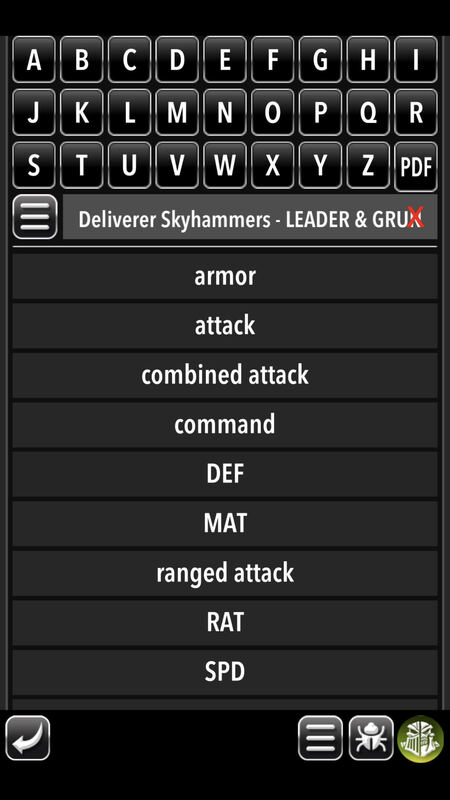 If you and a friend both have War Room, you can even connect to each other locally, so you can review each other’s army lists and see their adjusted damage as your armies smash each other. The last major feature of War Room I want to cover is the rulebook and keyword search. By pressing the button on the bottom of the screen, you can access the rulebook pdf and search for terms and icons commonly used in the game. This makes it easy to reference rules or icons you may not be familiar with in order to brush up on your game knowledge. In fact, when are viewing an actual model’s card, you can just press on icons and terms and it will open up the keyword search and automatically filter it to the functions in the area you pressed! Those are the major functions of War Room that I love and use all the time. Beyond those, there are a lot of other neat little features I’ll let you explore on your own, like the collection editor, where you can create a collection of your models and even indicate which ones are painted! And we haven’t even talked about Company of Iron, which is an alternative game mode that utilizes the same models from WARMACHINE & HORDES with similar but ultimately different rules. Suffice to say, War Room is your one-stop pocket buddy for all the game and models rules you need! So don’t wait, get it on your mobile app store today! !